Grain salads are a wonderful option for summer meals, and this one is bursting with flavour and nutrition. I served it with pork tenderloin that I seared in a cast iron skillet and then roasted in the oven. Delicious! 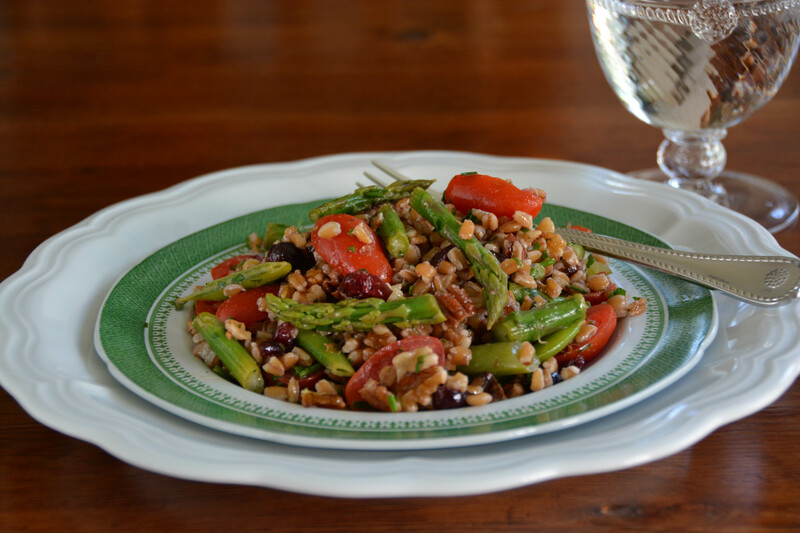 A versatile and flavourful grain and vegetable salad. Soak farro in a large bowl of water for 12 hours. Drain. Bring a large pot of lightly salted water to a boil. Add the drained farro and return to the boil. Simmer, uncovered over medium heat, stirring occasionally, until tender but still firm (about 30 minutes). Drain and allow to cool. Bring a large pot of lightly salted water to a boil. Add the asparagus and sugar snap peas and cook uncovered until tender (about 3 minutes). Drain in a colander. Spread the asparagus and sugar snap peas on a cookie sheet and place in the fridge until cool. Once cool, chop into 2" lengths and set aside. In a small bowl, place a pinch of sea salt and add the white balsamic vinegar. When the salt has dissolved, add the olive oil. Whisk with an immersion whisk until thoroughly emulsified. Pace the faro, asparagus, sugar snap peas, tomatoes, walnuts, cranberries, parsley and chives in a large bowl. Drizzle with the balsamic vinaigrette dressing. Toss thoroughly, adjust seasonings and serve. The salad is equally good chilled or at room temperature. 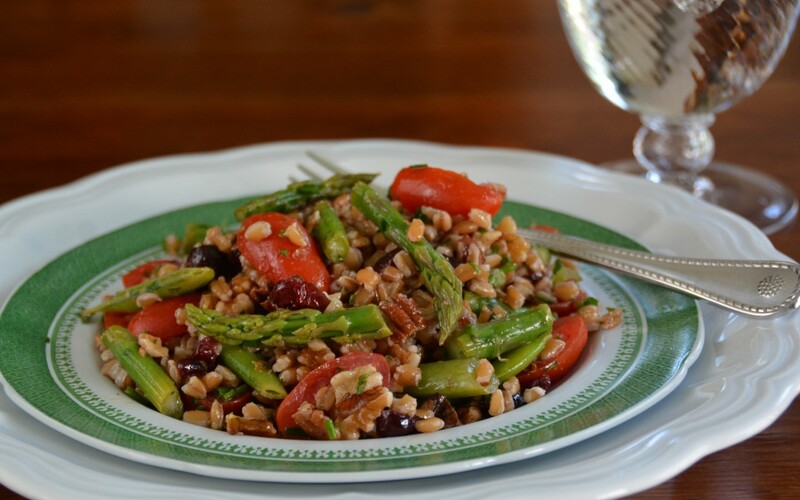 Farro is also known as wheat berries. They have it at Fortino’s, Linda. Enjoy!